I remember reading somewhere that when it comes to any kind of storytelling, there are a finite number of narrative templates for authors to follow, meaning a lot of what we’re reading and watching on television and in movies now is essentially just a rehash of something we’ve read or watched multiple times over. What basically separates the wheat from the chaff is how a specific storyteller depicts his characters and universe — either by engaging his audience to both or by boring them with the same old, same old. I bring this all up because there’s a certain story type that seems to be dominating the comic book marketplace right now — or at least capturing the hearts and minds of many readers. Local comic book shops are flush with very well-written and illustrated coming of age stories staring younger (usually teenage) female portagonists. The most notable of these series is Ms. Marvel, Batgirl and Marvel newcomer Silk. 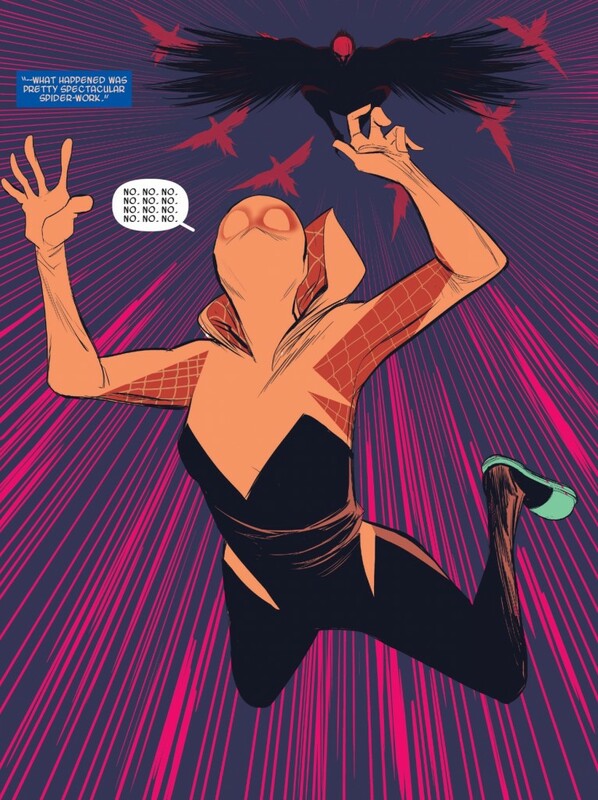 And I guess one can make a case that Spider-Gwen belongs in this crop as well … though I’d argue the approach creators Jason Latour and Robbi Rodriguez appear to be taking with their series through its first two issues is unique enough to distinguish Spider-Gwen from these other quality books. I’m not about to get into a debate about Spider-Gwen being BETTER than any of these comics — but it’s clearly different. And I like different. Similar to my what I wrote about Spider-Gwen #1, I think there’s something about what Latour and Rodriguez are doing with this book that’s a bit disarming and confusing for some readers — remember, they are building an ongoing universe now rather than just telling a one and done story. 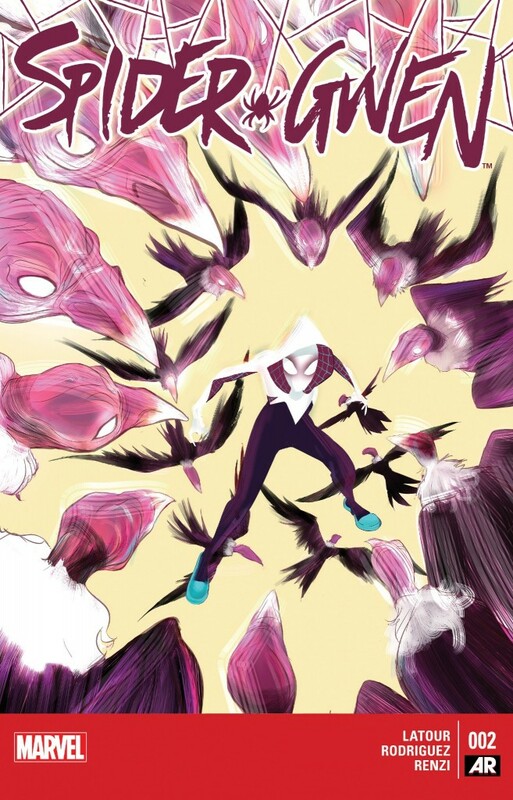 Spider-Gwen #2 continues with its universe building, introducing some new iterations of familiar characters like Kingpin and Jean Dewolff, while also building upon the foundation laid for those who have already made an appearance or cameo like Matt Murdock, Frank Castle, George Stacy, and of course, the titular character Gwen. It’s how the creative team continues to flesh out Gwen that I think really makes Spider-Gwen a riveting read, and my personal new favorite book being published by the Spider-office (as much as I continue to enjoy Spider-Man 2099, I’ve been desperately searching for that *it* book since the unfortunate cancellation of Superior Foes of Spider-Man last November — Spider-Gwen might be *it*). Again, Spider-Gwen is just another female teenage protagonist coming of age story — except it’s categorically different than Ms. Marvel, Batgirl, Silk, et al. A lot of reviews have pointed out the “punk rock” nature of the series, especially as it relates to Rodriguez’s pencils and character designs, and the eclectic color palette of colorist Rico Renzi. But beyond the unique aesthetic, this series has a considerably darker, offbeat vibe than a lot of other teenage-centric books. 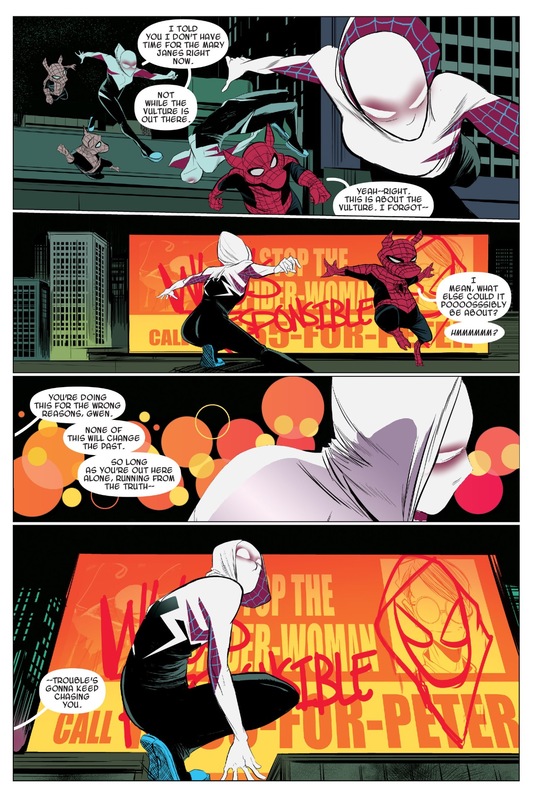 Case in point is how Spider-Gwen #2 uses Spider-Ham as a Clarence/guardian angle type, who walks Gwen through her life, helping her to understand what is actually at the root of her current crisis. There’s a familiar punchline to the Gwen/Spider-Ham journey that is typically found in many teen angst stories — while Gwen is embarrassed by her defeat at the hands of the Vulture, what is really eating at her is the fact that she has not yet spoken to her father since she admitted she was a vigilante superhero with a secret identity. But Spider-Gwen’s journey in getting to this personal revelation is far more divergent and irreverent than other current comics. There’s an almost dream-like state to everything happening in Spider-Gwen #2 … or Latour/Rodriguez’s narrative at least begs the question of how much is actually happening as we see it and how much is happening inside of Gwen’s head. This heightened, in some cases exaggerated approach to storytelling — I stop short of calling it unreliable narration but it certainly feels like it — adds a layer of complexity to Spider-Gwen that you don’t find in other teenage-centric comic books. 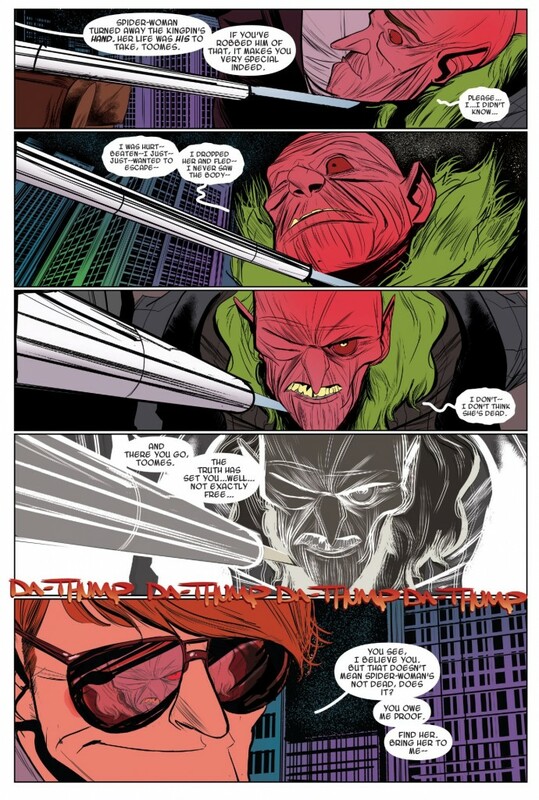 Additionally, while the comic might be called Spider-Gwen, Latour’s script doesn’t shy away from getting inside the heads of other characters. There are a number of sequences in Spider-Gwen #2 where the narrative shifts from Gwen to her father, George Stacy. I personally loved this choice from Latour and I hope it’s something that continues as this series progresses. Beyond the fact that it helps to illuminate George, and further develop his character, Gwen’s voice is just so different and “punk rock,” adding the insights of a more “grounded” character keeps Spider-Gwen from involving into a book that’s more gimmick than story. Plus, I feel like Latour had some interesting things to say from Captain Stacy’s perspective, whether it was his fear and awe of how Castle worked over criminals, or just his general apprehension/anxieties of being a bystander to his daughter’s downward spiral. Much like Gwen, the original George Stacy was more of an archetype than an fully realized character. He was the kindly father-figure, and his death still remains one of the more emotionally gut-wrenching moments in Amazing Spider-Man history, but to say he was a well developed character would be an outright lie. 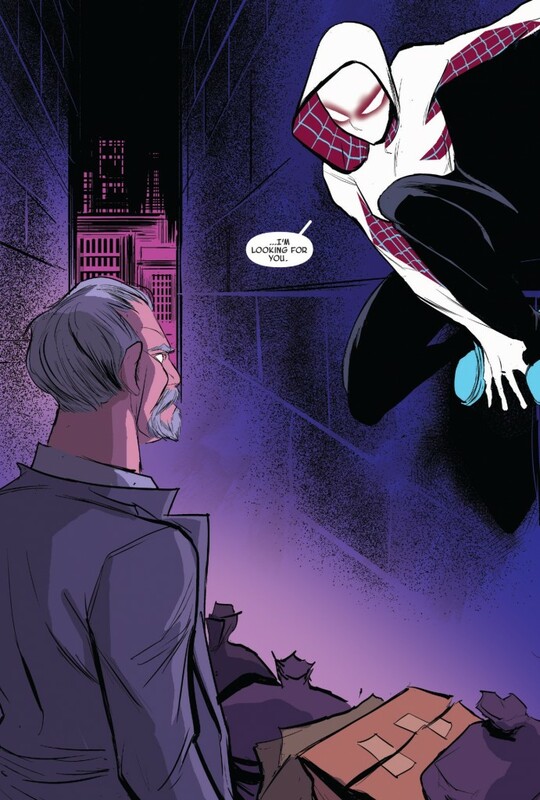 If Spider-Gwen ends up being not just a redemption of Gwen as a full-fledged character (and not just the original “women in a refrigerator) but also the redemption of her father, I think that would be an unexpectedly wonderful thing. Needless to say, under the stewardship of Latour and Rodriguez, the Stacy family has never looked better. Great spoiler-free review Mark. Glad I took the risk to read it since that majority of the time, I feel like I can’t read your stuff since It’s going to spoil me. Same goes for your podcast. I really need to catch up on my comics. Very solid review. I’ll have to give this one a try. I do love the angle of Matt being the Kingpin. Not to mention Gwen being hunted by Frank Castle. Oh yeah….